I am a paleoecologist who uses fossil plants to investigate the response of ancient forest ecosystems to environmental perturbations. Specifically, how did environmental changes affect taxonomic diversity, ecosystem structure, plant-insect interactions, and biogeographic patterns? By understanding how ecosystems reacted to past changes, we can better predict how modern ecosystems will respond to anthropogenic changes like CO2-induced global warming. The research conducted in my lab is field-based, specimen-based, and collaborative. 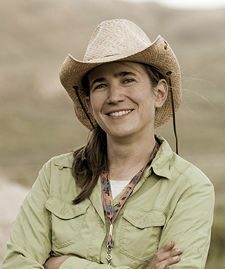 Current research focuses on: 1) biotic response to climate changes during the hothouse Paleogene in the Western US, particularly Wyoming, 2) the evolution of East African terrestrial ecosystems over the last 30 million years, and 3) the use of fossil plants to reconstruct paleoclimate and paleoenvironment. C. Crifò*, E.D. Currano, A. Baresch, and C. Jaramillo. 2014. Variations in angiosperm leaf vein density have implications for interpreting life form in the fossil record. Geology 42:919-922. A.D. Pan, B.F. Jacobs, and E.D. Currano. 2014. Dioscoreaceae fossils from the late Oligocene and early Miocene of Ethiopia. Botanical Journal of the Linnean Society 175:17-28. E.D. Currano. 2013. Ancient bug bites on ancient plants record forest ecosystem response to environmental perturbations. The Paleontological Society Papers 19:172-190. S.L. Wing and ED Currano. 2013. Plant response to a global greenhouse event 56 million years ago. American Journal of Botany 100: 1234-1254. C.C. Labandeira and E.D. Currano. 2013. The fossil record of Plant-Insect Dynamics. Annual Reviews of Earth and Planetary Science 41: 287-311. E.D. Currano, B.F. Jacobs, A.D. Pan, N.J. Tabor. 2011. Inferring ecological disturbance in the fossil record: A case study from the Oligocene of Ethiopia. Palaeogeographiy, Palaeoclimatology, Palaeoecology 309: 242-252. E.D. Currano, C.C. Labandeira, P. Wilf. 2010. Fossil insect folivory tracks paleotemperature for six million years. Ecological Monographs 80:547-567. E.D. Currano. 2009. Patchiness and long-term change in early Eocene insect feeding damage. Paleobiology 35: 484-498. In the coming semesters, I will be teaching courses on paleobotany, paleoecology, and paleoclimatology. The University of Wyoming is situated in a celebrated, world-class area for deep-time paleobotany, and I intend to take full advantage of this both in my formal courses and as a mentor for independent student research. My formal courses emphasize active and process-based learning, critical thinking, and the scientific method because I firmly believe that the people who will make an impact in the world are those who know how to critique and share information and can adapt to the unexpected. I am a co-founder of The Bearded Lady Project: Challenging the Face of Science, a documentary film and photography project that investigates our stereotypes of what a field scientist looks like.